It should be a given that I have to take photos of all fabulous Red British Telephone Booths whenever I come across them. And yes, you’d be correct to guess that after several trips to Britain, I have taken more than my share of photos of those phone boxes. It’s a weakness for that great bright red and a very retro-cool design. This particular black and white art print really speaks to me. I love the wet paving stones reflecting the city’s lights. The photo this was based on was taken on the Royal Mile near St. Giles’ Cathedral on my last night in Edinburgh. In the dark of a winter night, there was actually very little color in the original photo. 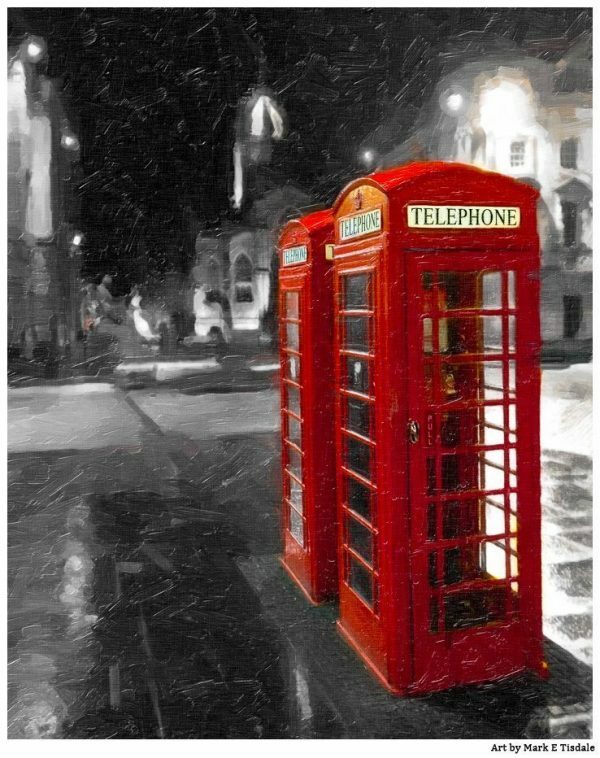 That informed my decision to desaturate everything except the brilliant red of the British telephone booths. The resulting picture really pops as a result of the selective color and all the reflecting light. I can almost re-live the cool damp air of Edinburgh on a winter night. I’ve added a variety of textures to this image as I do with many of my photo art pieces. The result is a really dramatic painterly print that both reminds me of Edinburgh, Scotland’s royal mile and my general love affair with all things British! It very much reminds me of the type of artwork one might find in a British Pub – you know if they didn’t already have a full sized one standing in the corner. And yes, I’ve seen more than one far from Britain in or outside of a pub. 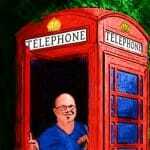 It just shows how much these British Telephone Booths have become an emblem of Great Britain. Note: These K6 Telephone Kiosks are an Historic Scotland Listed Building.